Anglo-Dutch multinational oil and gas company Royal Dutch Shell plc is laying down plans for the decommissioning of its massive platforms in the Brent oilfield in the UK North Sea which will mark a major milestone in the country’s oil and gas industry. After spending 10 years in finding the safest way to dismantle its aging rigs, the oil giant is now submitting its plans to the UK government. The work to decommission Brent could take as long as ten years, turning a page on the oil and gas field which has been a cornerstone of the UK’s multi-billion pound oil and gas industry for over four decades. At its peak in the early eighties, Brent produced 500,000 barrels of oil a day and Shell estimates that over its lifetime Brent produced around four billion barrels of oil, which is almost 10% of all the oil and gas produced in the UK sector of the North Sea. But after 40 years, Shell is preparing to retire, or “decommission”, Brent’s four aging oil platforms in some of the most hostile working environments in the world. Sinead Lynch, Shell’s UK country chairman, said that there was no easy solution for the technical challenge of decommissioning the oil rigs but they believe they have come up with robust proposals on how it can be best achieved. Shell will apply for an exemption to international rules which call for the entire structure to be removed from the seabed.Instead, Shell will make a case for keeping the “legs” of the giant rigs in place, which it says will be safer and pose minimal environmental impact. Lynch said that the rigs, constructed nearly half a century ago, were not designed to be removed. 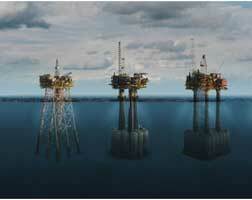 The safety of those who will work offshore to achieve the project will have to be considered. The safety risks associated with trying to remove them outweigh minimal environmental benefit, she said. The international convention requiring Shell to completely remove the rig from the seabed was put in place in the mid-1990’s to protect the north-east Atlantic seabed after a groundswell of protest against Shell’s plans to decommission Brent Spar, a floating oil storage facility, by towing it out into the deep waters of the Atlantic and sinking it. The previous plans to dismantle the rigs attracted widespread protest because the company had failed to engage adequately with other people and organizations, Lynch said. “This time, our conclusions follow more than 300 studies and extensive engagement over 10 years with around 180 organizations across Europe, from the Scottish Fishermen’s Federation to the World Wildlife Fund Scotland. A government-led public consultation period of 60 days now begins. All responses will be considered by the government, alongside our recommendations,” she added. The plans are also expected to outline how Shell intends to secure 154 oil wells and remove the tops of its four towering platforms which each measure almost 300 meters from the seabed to the tips of the “topside”installations.Shell also needs to recover debris left on the seabed while extracting the oil trapped in underwater storage cells. Lynch said the decommissioning project itself could sustain hundreds of jobs. The skills and innovative technologies developed, along with the experiences gained, could be shared and exported as other ageing oil and gas platforms wind down production in other parts of the world, Lynch said. “Just as Aberdeen has become a center of oil and gas industry expertise that has been globally exported, decommissioning now offers further commercial opportunities in the global market for UK businesses,” she added.